Carvin bolt neck on ibanez s series AANJ? 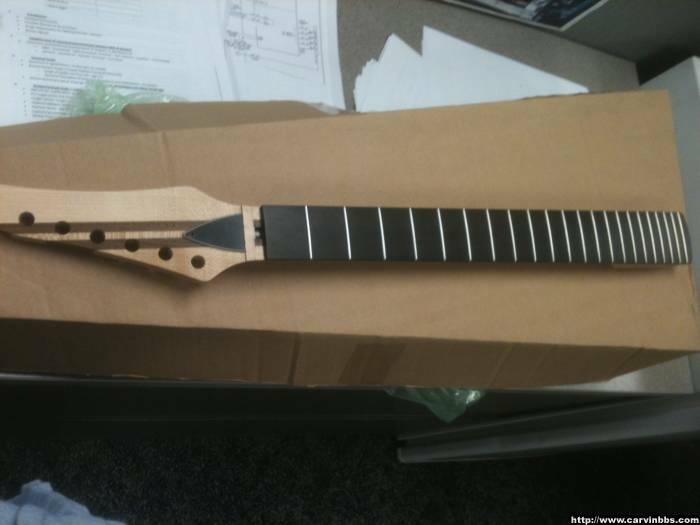 re: Carvin bolt neck on ibanez s series AANJ? Last edited by Totenkampf on Thu Jan 24, 2013 9:19 am, edited 1 time in total. I've never used the online ordering .. but you can get a Bolt Plus in any wood and finish you like. You can get the same options in a kit, if you like. Just call and order. The online ordering is nice, but they can't provide every conceivable option there. I got the neck in today - 5 piece maple/walnut bolt on with inline headstock, ebony board, SS XJ frets, 14" radius, undrilled, prepped and complete with FR locking nut, unfinished BON and headstock...overall very nice. My one complaint is the dressing on the fretwire sides, every one sits proud and cuts into my hand so I will have to go back and grind every one down. That was pretty disappointing on a 400$ neck, but to be fair I dont know how old this is...it could have sat in somones unconditioned storage forever and the wood shrank, i can tell the board already needs some oil and the walnut laminates have shrunk in very slightly. i cant complain much though since its almost exactly what i would buy from Carvin new (i prefer the reverse inline HS) and i paid a c-note for it in this unused condition. i didnt even bother to haggle. i just recalled the charvel fusion is 24.75 scale so i am hoping to find a predator or model 3 in RC or a really pimp jackson RR. I came across a couple other obscure choices like the zion 'technofrost' finish and the kramer 'holocrackle' finish. the latter can be bought new from mean street guitars.